Beds and mattresses require professional and deep sanitising to get rid of dust mites, allergens, stains, odours, bed bugs and allergens. Every mattress should be deep cleaned at least once every six months and more often whenever it gets stained or filthy. We can provide the professional cleaning of the mattresses and beds in your home, hostel, hospital, other domestic and commercial property. The mattress cleaning which we offer in the region of Bankside SE1 is trustworthy and inexpensive. Get in touch with our phone operators and representatives to book the inspection of the mattresses in your estate. If the mattress in your property has stains from drinks and liquids, unpleasant smells and looks dirty, get in touch with our staff to take care of it. They will inspect it closely and choose the most appropriate preparations, cleaning solutions and machines to sanitise it. The spills and odours will be eliminated completely from its fabric. 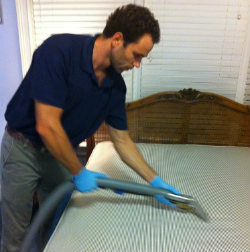 Our staff can apply dry and steam cleaning on the mattress using effective and advanced machines. The steam cleaning ensures full extraction of dust mites, dander, allergens, bed bugs and bacteria through the use of steam and mild cleaning solution. The dry cleaning eliminates moisture, stains and smells of every origin. After being cleaned every mattress is deodorised to become pleasantly scented. Use our professional mattress cleaning services, available in and around Bankside at competitive rates. The mattress cleaning which we offer is affordable, professional and guarantees complete removal of contaminants and stains. Use our services to refresh and disinfect the mattresses in your property. Our mattress cleaning services are at your disposal in SE1 Bankside seven days in the week. You can order them for your home, rented property, hotel, hostel or hospital to ensure the impeccable and hygienic state of your mattresses. We guarantee you that the work of our employees is very effective.